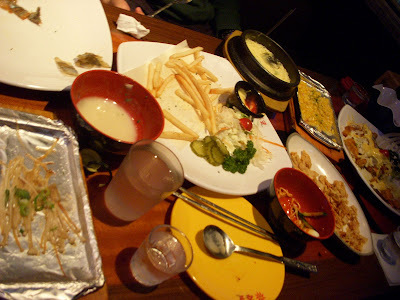 We went to a bar called Junco, and we got ALL these side dishes for *free* (service). The only thing we ordered was Cajun chicken & a plate of fries... everything else was just 'service'... corn, noodles, soup, mushrooms, fish, crisps, egg bake, fruit etc! Busan (2) Motel...better than a hotel!